The Buzz Boyz attended the AAMA Gala, East Coast Bowling and the IAAPA Attractions Expo in the latter part of last year. 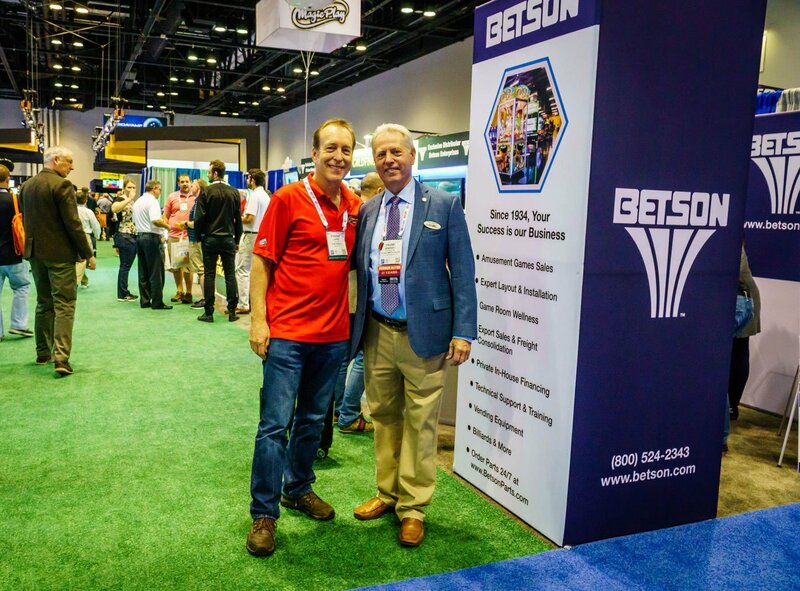 Each event covered an important sector of our industry but as always, IAAPA covered it all. The coin-op section has gotten much larger. We have never seen so many new games introduced. It was a full four days for us to get to see them all. Both of the Buzz Boyz were busy doing video interviews and learning from some of the legends in the industry. We highly recommend viewing the informative interviews with industry icons Eugene Jarvis, CEO Raw Thrills; Malcolm Steimberg, Chairman of LAI, Time Zone, EMBED; Eric Verstraeten, Group CEO Elaut; and Jorge Mochkovsky, Founder CEO Sacoa. The first three days were extremely busy – a lot of business, a lot of leads. The Industry is doing very well. The strength of redemption continues however, and video saw some great new games. Raw Thrills CEO Eugene Jarvis is interviewed by Frank Seninsky on the show floor of the 2017 IAAPA Attractions Expo at the Betson Booth. Merchandise and Retail was also bigger this year as well. There were more souvenir, gifts, and novelty vendors at IAAPA this year than in the past. Licensed plush displayers were exciting to see even though almost all of the plush suppliers have private shows outside of the Expo in Las Vegas. Foreign exhibitors are developing more hi-tech products. Several companies from Great Britain marketing as a group had a section of virtual reality (VR). The Chinese and Koreans were more aggressive than in the recent past, all looking to sell products into the U.S. market. An increase in the number of foreign exhibitors indicates that these companies are getting more comfortable selling in the U.S.
We found that the food area was not as promoted as we expected that section would be. In general people are looking for better quality food and beverage choices. An example of this trend in bowling is offering better food and focusing on craft beers. AAMA Gala: October 2-6, Renaissance Chicago North Shore Hotel, Northbrook, Ill.
• Holly Hampton (Bay-Tek) becomes new AAMA President (two-year term). • David Cohn (Firestone) received the Lifetime Achievement Award. The journal that Allen Weisberg (Apple Industries) was in charge of brought in $93,000 in ads. Allen did a great job but the main reason was because David Cohn 100 percent deserves this award for all of the tireless charitable work he has done and continues to do for our industry. Congrats, David! • CEC Entertainment’s Mahesh Sadarangani, Sr. VP of Strategic Initiatives, gave an informative keynote that was standing-room only, as he kept everyone glued in place. Very informative. I, for one, learned many things about our industry that only a person that has access to data from 1000 locations every day could possibly know. What I really got to understand is that Mahesh is a fast reader! • Todd Louthain (Bay-Tek) won the raffle and everyone was so happy because Todd’s family home recently burned down. Yes, there must be a God out there who assists in which ticket is drawn! • AAMA has a new program, ‘AAMA Benefits Program’ that offers discounts on commonly used products and services that every company in the industry can use. There is little doubt that my (Frank’s) company will save thousands of dollars every year. ECBCC East Coast Bowling Centers Convention – October 23-25, Kalahari Resort & Convention Center, Pocono Manor, Pa.
• More than 500 Bowling Center Proprietors/Managers from Pennsylvania, New Jersey, New York, Connecticut and Maryland came to learn ways to improve their centers, many considering removing lanes and putting in full redemption game zones and other family attractions. • Frank ‘the Crank’ gave a seminar titled, “Maximize Your Redemption Revenue – 13 Key Things You Need to Know to Maximize Redemption & Merchandise Revenues and Increase Your Bowling Center’s Bottom Line.” The approximately 25 attendees were very interested in finding the correct space within their bowling center to expand to a full redemption games zone. This is certainly the ‘buzz’ of the bowling industry. • Speed painter Tim Decker thrilled the attendees painting four pictures that were auctioned off by BPAA Executive Director Frank DeSocio. The paintings brought more than $20,000 that will be donated to Bowling Veterans Link (BVL). BVL has raised more than $50 Million since its inception 75 years ago. Shopping centers have a lot of space, now they want our industry as an anchor. Health clubs, movie theaters, there was a time when these properties didn’t want family entertainment. Everyone should be proud that we have arrived, and that it is our time to aggressively go after these opportunities!